I had always made my Key Lime Pies with Meringue. That was how they were when I was a kid, that was the recipe I had taken back home in the 80s when I started coming back, and that is just how it is. Whipped cream just isn't enough for me. 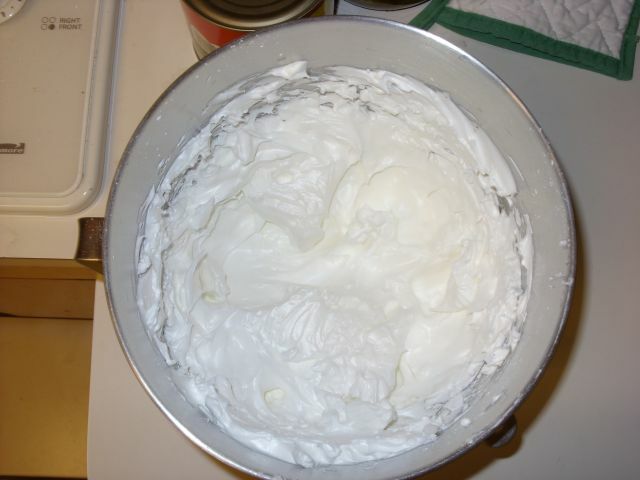 In a glass or stainless steel bowl, beat egg whites until soft peaks form. Combine sugar, cornstarch, and salt; gradually beat into the egg whites. Continue beating until egg whites no longer feel gritty (with sugar)when a little is smeared between two fingers. Spoon onto the hot pie filling, spreading to cover completely to the crust. 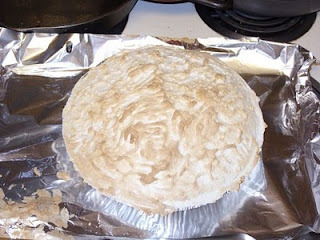 Put back in the oven and bake at 350° until meringue is browned, about 12 to 15 minutes. First off, that blurb above is for a recipe that is made in two steps. Bake the pie, pull it out, then dress with meringue and finish it off. My old recipe was done in one step - decorate the filled pie and bake. 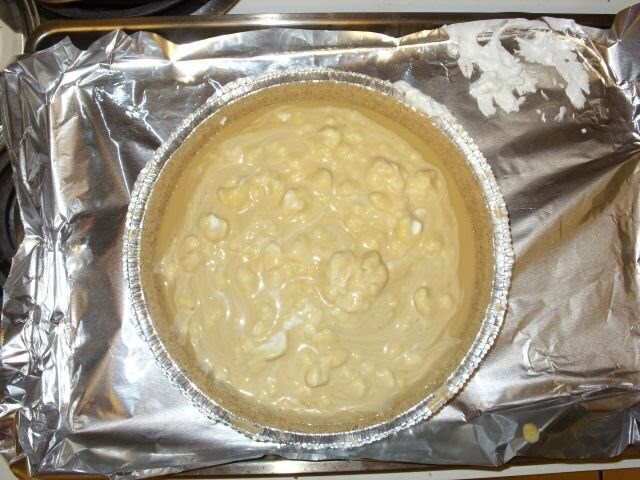 This two step process thickens the pie by cooking the filling and then you put the meringue on and bake that. This was the Lumpy Pie and how I prepared it by folding in some Meringue first and allowing it to stick to the Meringue you add on top. Meringue will start to brown after about 15 minutes but that will vary depending on how thick you raise your whites. That is controlled by how firmly whipped the eggs whites are and what you add to the egg and sugar mixture. This recipe also does not mention having room temperature egg whites - I have always made meringue with room temp egg whites. That was what they told me to do... let them sit out for 30 minutes, separate egg white from yolk. I think that making Meringue is one of those things. You make it the way you were taught and everyone else is WRONG. In other words, if it works, great - you need to get a recipe, then work at it until it is perfect. My variations here were ... amusing. First of all, I always used Cream of Tartar when making Meringue. I don't know why, my first recipe had 1/4 teaspoon added to it to give it body I guess. So I added that to the mixer while it was turned on. Add to that, the Cornstarch. Cornstarch is a thickener. You don't really taste the stuff but it adds body. I keep it in the house because every so often I want to make a stir fry meal with a sauce. Cook in the wok, pull your food out, then toss Cornstarch in to make it thicker, maybe with a little water. Add all that together, put it into the mixer and turn it on until it looks done. Beautiful stuff, but it was VERY thick. I could have stopped earlier, and had a lighter Meringue, but I am stubborn. I'd rather have something that I KNOW will work than have to guess. Cornstarch plus Cream of Tartar plus the eggs and sugar in a Stand Mixer with a whisk. I've made Meringue by hand in a bowl - and all of the tools must be scrupulously sterile and free of any grease or this won't rise. Mine was as you can see. Just how risen it was is shown in this picture. You can actually see little building blocks of fluff piled on top of each other with holes and craters. It looked to me like someone blew up the Meringue with some firecrackers, then scooped it back on top. I did say I got it wrong didn't I? But hey, I'm not done yet! The thing still has to be smoothed out and baked. It actually ended up tasting great. The pie was a little loose, and that's easy enough to fix - bake it longer. I smoothed out the Meringue, tried for a few peaks and decided it was just too thick. The oven was at 350, and I pulled it out after 20 minutes. The layer of fluff was about the same as the depth of the pie shell - so next time more egg whites. My old recipe was 4 yolks to 6 whites. 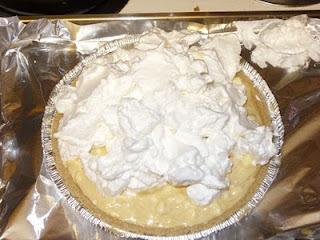 The recipe above was 3 or 4 whites - not quite enough Meringue for this pie. Anxious cooks everywhere will realize what went through my head. I guess the recipe way above is right - cook the pie for about 15 minutes at 325, pull the pie from the oven, turn the temp up to 350. Then apply the Meringue, artfully to the top, and place the pie back into the oven and bake until it is done - another 15 minutes. The next time I make the Key Lime Pie, I will follow the recipe... I promise. The pie above tasted wonderful, I made enough to go across the street and when talking to the neighbor last night, he was still raving about it a week later. Taste is one thing, perfection is another. When or if I achieve that level of perfection, I'll let you know... I still have 5 more Pie Crusts to go through! When the mistake turns out better than what you get when you are at the store... I'm willing to make the mistakes. So what is this bar thing at the bottom?